When I used to get sick as a little boy in Singapore, one of the things I looked forward to was the plain rice porridge that I would be given. It is just plain white rice boiled in plenty of water until it becomes a thick hot mush. What makes the meal so special is the crunchy salty and sweet celtuce pickle full of soy umami that accompanied the steamy porridge. It is simply the perfect antidote for stuffy nose or sore throat. 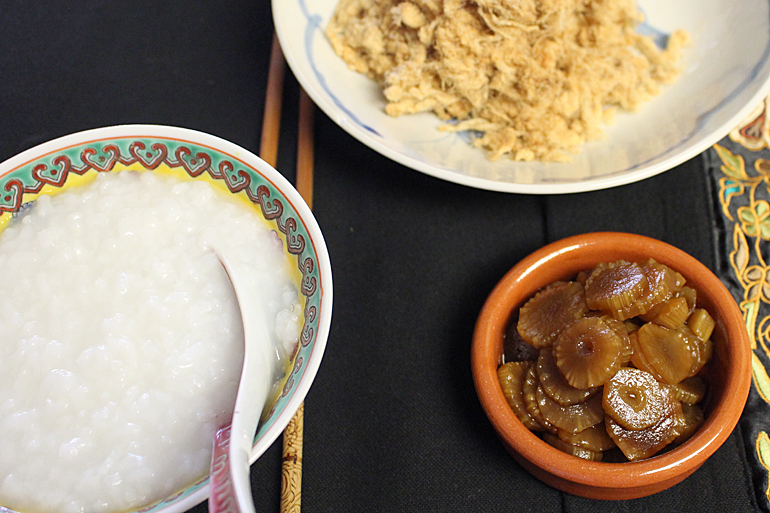 Unlike Cantonese congee, the porridge that my Fujian family enjoyed is not flavored with stock or seasoned with meat. Instead celtuce, cucumber or radish pickled in soy brine along with pork floss and salted duck egg are served with it. This simple meal is a common breakfast and the go-to food for sick children. There is something very warm and comforting about it. 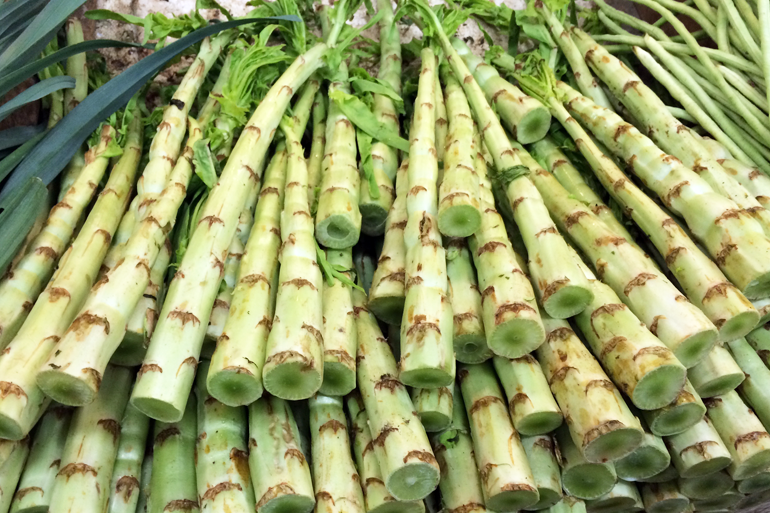 So what is celtuce? Celtuce (萵筍) is a variety of lettuce grown primarily for its thick stem, which can be used for cooking or pickling. It is a refreshingly crunchy and succulent vegetable that contrasts well with other ingredients in stir-fries and cold dishes because it keeps its crunchy texture even after cooking and marinating. Soy sauce based pickling is very common in Chinese cooking, and celtuce is a common ingredient for this purpose. It is first marinated using salt and sugar to extract the natural juices before being pickled in soy brine. Soy sauce and sugar are the two main ingredients in the pickling brine and produce a slightly sweet pickle full of soy flavor. Fresh pickle can be made easily and stored in the refrigerator for about a month. But what if we want to preserve it for a longer period of time? For this I look to my friend Cathy Barrow for an answer. 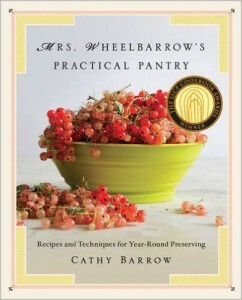 Cathy, who is behind the popular blog Mrs. Wheelbarrow’s Kitchen, wrote a book on preserving food at home that was released last year. 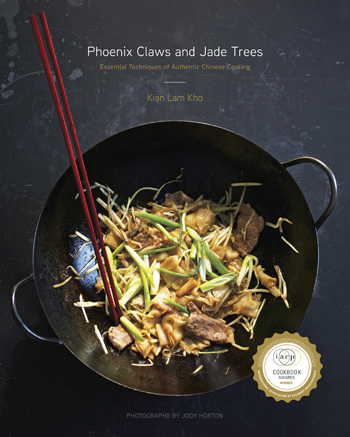 The book, Mrs. Wheelbarrow’s Practical Pantry: Recipes and Techniques for Year-Round Preserving , won the IACP Award earlier this year and has become a standard for home food preservation. 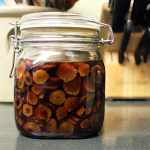 Like many people, initially I shunned the canning process for fear of not being able to do it properly. But Cathy explains each step of the food preservation clearly and concisely. The first chapter in her book on “The Basics of Water-Bath Canning” convinced me that I could safely and successfully can celtuce pickle. Using Cathy’s technique for water-bath canning I share with you the following recipe for making celtuce pickle. In addition to celtuce you can similarly pickle cucumbers and radishes, which are still available in the market, for use later in the year when winter limits the availability of fresh produce. Here’s to the last of summer vegetables! 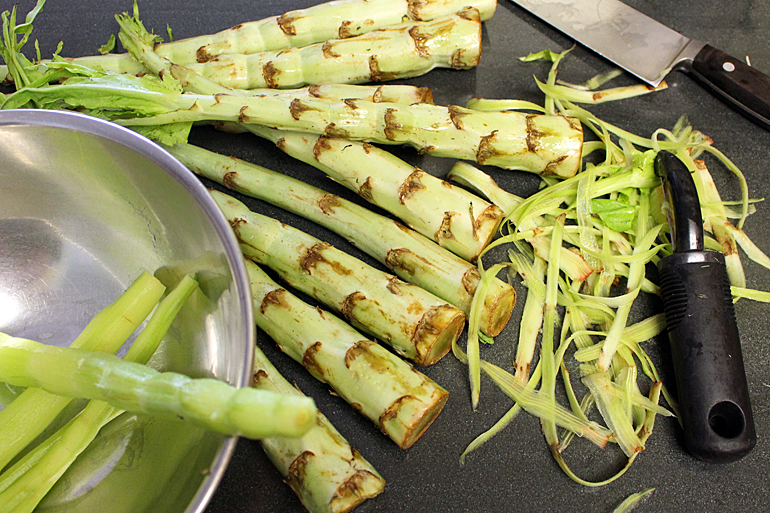 Peel the celtuce and cut them crosswise into slices of about 1/8 inch thick. Put the celtuce slices in a medium bowl and sprinkle with the salt. Stir the celtuce well to make sure the salt is applied evenly, and let it marinate for about 30 minutes at room temperature. At this point the most of the liquid will have bled out of the celtuce and collected at the bottom of the bowl. Squeeze as much of the remaining liquid out of the celtuce as possible and discard all the liquid. Sprinkle the 1 tablespoon sugar over the celtuce and mix well. Let the celtuce marinate for another 30 minutes at room temperature. As with the salt, a pool of liquid will form at the bottom of the bowl. Once again squeeze out as much of the remianing liquid as possible and discard all the liquid. Add the ingredients for the soy pickling brine to the celtuce, and mix well. 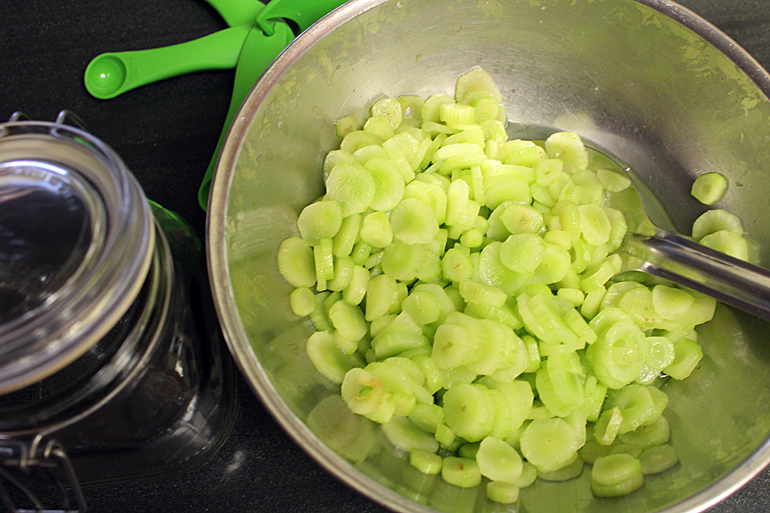 Transfer the celtuce and brine to a storage container, cover, and refrigerate at least overnight or up to a month. To store the pickle for a longer period of time, put the pickle in two 8-ounce pickling jars and cover tightly. 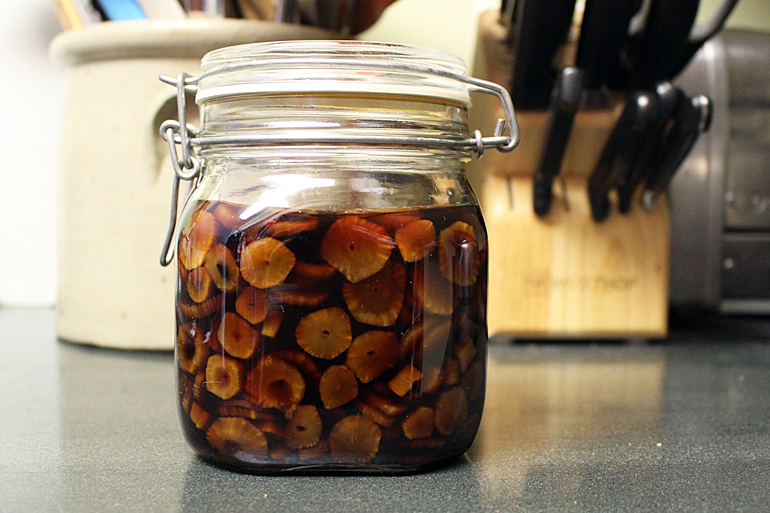 Process the jars by placing them in a pot of hot water enough to submerge the jars for up to 2 inches in depth. Cover the pot and bring the water to a boil and heat the jars for about 10 minutes. Turn off the heat and let the jars cool slowly. Remove from the pot and store the pickle on the shelf for up a year. This recipe is amazing. I actually tried it at home. It is very similar to my own recipe for pickled radish. It will be celtuce harvesting time before we know it! I’ll have to save this recipe!